A woman has revealed how she shunned a career in modelling and left her comfortable town life to look after more than 1,000 sheep… and eight children. 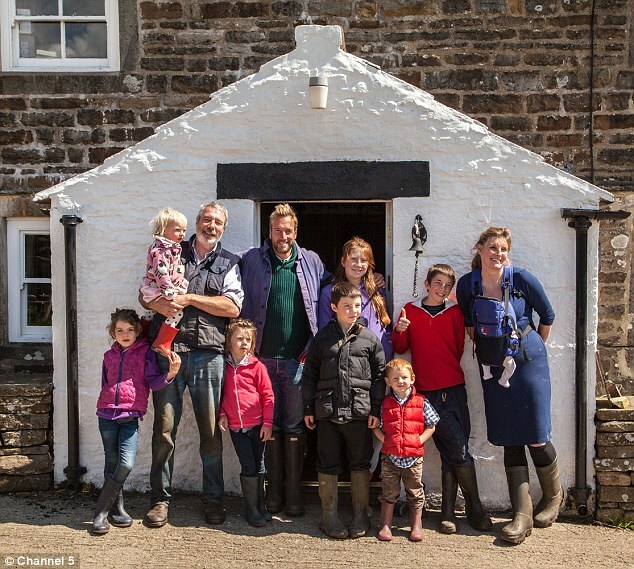 Amanda Owen, 40, from Huddersfield lives in a 2,000-acre hill farm in the Yorkshire Dales with her husband Clive, who is 21 years her senior at 61, and their brood who are aged between 14 and five weeks old. After trading the rat race for the sheep amble, Amanda – who appears on Ben Fogle’s programme New Lives In The Wild – now feeds 10 mouths on just £130 a week and says ‘I’m living the life I dreamed of’. Amanda grew up in a traditional three-bed house with her parents and one sibling in the large market town of Huddersfield. At 6ft 2in she was encouraged to follow the same career path as her model mother, but she hated the clothes and make-up that she had to wear. ‘In fact I couldn’t believe that kind of life really existed,’ she added. Amanda left her comfortable town life to work on farms around the country, but it’s when she knocked on the door of Ravenseat Farm that she found her calling. ‘I was destined to come here – I’m absolutely sure of it,’ she said on the show, which airs this Thursday. Clive, 42, lived on the 2,000-acre plot of land and, despite the 21-year age gap, the couple quickly fell in love. Since marrying in 2000, they have had eight children together. Many of them help out on the farm when they are not at school – or travelling to and from as the journey takes one-and-a-half hours each way. ‘In order to make a big family work they all need to tow the line. It’s not about child labour – it’s about pulling together,’ said Amanda. Their traditional way of life helps keep costs down, too. With the nearest shop so far away – and the risk during winter that they could be snowed in for weeks – Amanda buys food in bulk, and manages to feed her large family for just £130 a week. Their water is free, channelled from the stream on the moor, and they heat the house and water with a roaring fire, which burns every day no matter what the weather. The biggest utilities bill is electricity, which costs £160 per month. They pay for their annual tenancy in the stone farmhouse with the profits made from farming – although this can be a struggle with 2,000 kilos of sheep’s wool going for just £65. On a good day they will sheer 130 sheep and Amanda jokes that, having had baby Clemmie just five weeks ago, it is great post-natal exercise. But if sheep shearing is a million miles away from a yummy mummy yoga class, then the way Amanda gave birth is on another planet. ‘When I had all the signs that I was going into labour I decided I was just going to stay here and not say anything to anybody. Amanda gave birth to baby Clemmie on her own on the floor in front of the farmhouse fire. ‘Of all the births I’ve had this one has to have been the best – it was the most relaxing, the most quiet, the most peaceful,’ she said. Although she wasn’t sure she could say the same for Clive, who was ‘very, very shocked’ when she woke him up to meet their baby girl. Of course there’s no such thing as maternity leave on a farm, so Amanda gets back out in the field for her ‘stick-and-dog’ shepherding with Clemmie strapped to her front. But with eight children – four of which are under fives – more than 1,000 sheep, plus cows, chickens and even a peacock, Amanda still doesn’t think they’ve finished adding to their brood. They’re keen, too, to pass their farming legacy down to the children – with Clive saying the sooner they can take over the better, although he’s not bothered about retiring to a bungalow any time soon. Amanda wants her children to follow in their footsteps as long as it makes them happy, despite it being hard financially. ‘I followed my dream – which at the time was frowned on as a ridiculous idea – and here I am now,’ she said.